In a span of a week we have witnessed per-referendum agonies, post referendum joy (and depression), then we learned that the provisional constitution will be a mishmash of the amended articles we voted on and some bits and pieces for the old 1971 constitution. Lots of people are shaking their heads and saying, “what was it that I voted for?” More puzzling still is why didn’t we have a referendum on the provisional constitution instead of the amended articles. Is there foul play involved? Something smells!!! Then came the trifling bit of news that Egypt has resumed pumping gas to Israel at the fantastically low prices that were “negotiated” by Mubarak cronies. What happened to our revolutionary prime minister? “Rome was not built in a day”, some may say, and they would follow it by “give the guy a chance”. So we forget about trifles and we move on. Then we hear that many protesters have been unfairly detained and some received absurd sentences for “thuggery”. We hear from reputable human rights organization that some female protesters have been subject to a disgustingly degrading treatment by the army. We try to reason that sometimes accidents happen and it will be a matter of time and everything will be resolved. We keep hearing “Rome was..” and we wait for some good news to arrive. But it does not !!! We see the ministry of interior burning and we hear of assassination plans. We are clueless still, and just when we thought that things couldn’t get worse, we get a knockout. Our ministerial cabinet, upon which so much hope has been placed, decreed that hence forth all forms of “disruptive” protest are banned. If that was not disappointing enough, soon after we see a peaceful sit-in at Cairo University brutally disbanded, students detained (later released) and university professors verbally abused and then herded into armored vehicles (only to be released later). But emotions aside we are determined to march forward. We will pry open or crush whatever black boxes we find on our way. Rome was not build in a day, but we will not stand idle while injustices are being perpetuated. 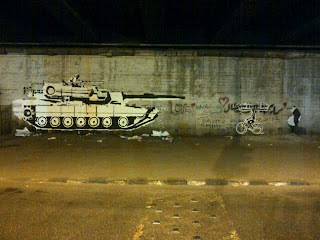 Tahrir! here we come again!